Do you know anyone with a little STRESS? Stress and Health are two topics that affect everyone. 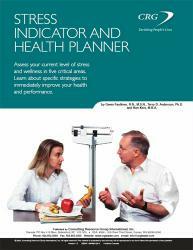 The Stress Indicator and Health Planner (SIHP) assesses your clients’ current level of stress and health. Use it to understand how to enhance overall well-being, manage stress, and improve performance. Life is too short to die from a heart attack at the halfway mark! Support your clients and employees in creating healthy lifestyles. Incorporate the Stress Indicator and Health Planner into your business today.